After a two-week stay with us, my parents flew back home this afternoon. My kids weren't too happy to see them go, and neither was I!! We had a wonderful time while they were here, with way too much spoiling going on!! It was a sad good-bye but we're so thankful to get to see them! Now for the hello's......HELLO to all my new followers! I'm up to THIRTY already!! I just about fell off my chair today when I saw that!! 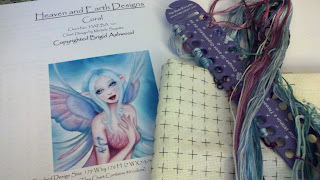 Thirty total followers means that 15 joined after my contest announcement, so I'm adding 1 more item to the prize stash! I haven't had a chance to snap any shots, so I'll load a picture of the new item ASAP. I also started a bit on my two Heaven and Earth Designs pieces. My progress on Cathedral is going slower than I'd like, but the piece is so big its difficult not to get frustrated. I've finally found all my floss for Coral and finished the gridding the other night. Hoping to kick that one off this week! I'm hoping to finish both Angel of Hope and Coral in time for Christmas, to give them as gifts. Wish me luck!! Now to get caught up on everyone's blogs from the last two weeks!! Sounds like you had a wonderful visit with your parents. Your Angel of Hope is looking beautiful. Good luck on your Christmas gifts! Angel of Hope is looking great! It's coming along so quickly. Glad that you had a fun time with your parents and congratulations on attaining 30 followers - awesome! Congrats on 30 followers. 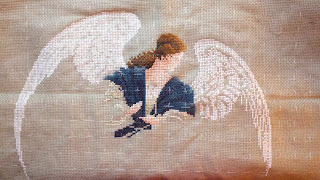 Lovely progress on your Angel. Glad you enjoyed the visit from your parents. Your angel looks lovely and I like your HAED. It sounds like you had a wonderful time with your parents Lesli, glad you shared some quality time together. Your Angel looks simply stunning, I'm looking forward to seeing this project grow. Best wishes. Thanks everyone!! Having you all here cheering me on definitely motiviates me to keep on working....which is motivation I love! Coral is such a pretty fairy. You're brave to do HAED's. Your angel looks great.